Pelvic Fractures in children are often associated with serious injuries. Tile classification This classification is used for both child and adult fractures. Class A These fractures are inherently stable. They may include avulsion injuries; other injuries are uncommon. 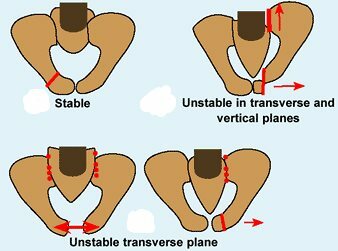 Class B This includes fractures that are unstable in the transverse (horizontal) plane. Class C These fractures show instability in both transverse and vertical planes. Torode and Zieg classification This classification includes four groups of pelvic fractures. Type I avulsion These occur at sites of bone or tendon attachment. Type II iliac wing These are relatively common and typical of childhood pelvic fractures. Type III simple ring These usually involve the pubic rami or symphysis. Type IV ring disruption In these fractures, the pelvis is unstable. Evaluate by careful examination and imaging. Order a CT scan if the fracture pattern is unclear. Type III and IV fractures suggest the possibility of additional injuries. Evaluate the abdomen, gastrointestinal, and genitourinary systems. Keep in mind that a pelvic fracture is a marker for other injuries that pose more threat than the fracture. Manage most pelvic fractures conservatively. Stabilize type IV ring disruptions by external fixators or internal fixation. Most late musculoskeletal disability results from pelvic malunion, causing persisting pelvic asymmetry and malunited acetabular fractures. Nonunions may remain silent. Overall mortality is about 10–15% due to associated injuries. Need for transfusions is only about 15–20%, considerably less than for adults. Avulsion fractures are relatively common injuries. They occur at a variety of sites. Avusions are most common in the anterior inferior spine, lessor trochanter, and anterior superior spine. Avulsions of the ischial tuberosity and greater trochanter are less common but more serious. These injuries may be acute with an injury or due to repetitive trauma. Diagnosis With chronic lesions, the differential diagnosis includes tumors and infection. The localization of tenderness, radiographic features, and improvement following limited activities are usually diagnostic. Management Manage most by rest. Ischial avulsions with displacement exceeding 1 cm may be considered for replacement to prevent asymmetry for sitting or nonunion. Reduce and fix avulsion fractures of the greater trochanter. Classification Acetabular fractures are classified based on location, displacement, and stability. Diagnosis A diagnosis of osteochondral or chondral fractures is most difficult to make. Be suspicious if joint space widening is seen following reduction. Bony injury pattern can be evaluated by three-dimensional CT reconstructions. Management Openly reduce and fix unstable posterior fracture dislocations. Apply the 2-mm rule as with other articular fractures. Prognosis Osteoarthritis may complicate unreduced or comminuted fractures. Triradiate cartilage injuries are rare but serious because they may result in physeal closure and progressively increasing acetabular dysplasia. Diagnosis Evaluate by radiographs and CT scans. Three-dimensional reconstructions may be helpful in assessing the injury. Later, the fusion may be visible by plane radiographs. Often the diagnosis is made late when fusion is obvious and acetabular deficiency develops. Treatment Physeal bridge resection is difficult and its outcomes are uncertain. Acetabular insufficiency may require correction by acetabular augmention or Chiari osteotomy.